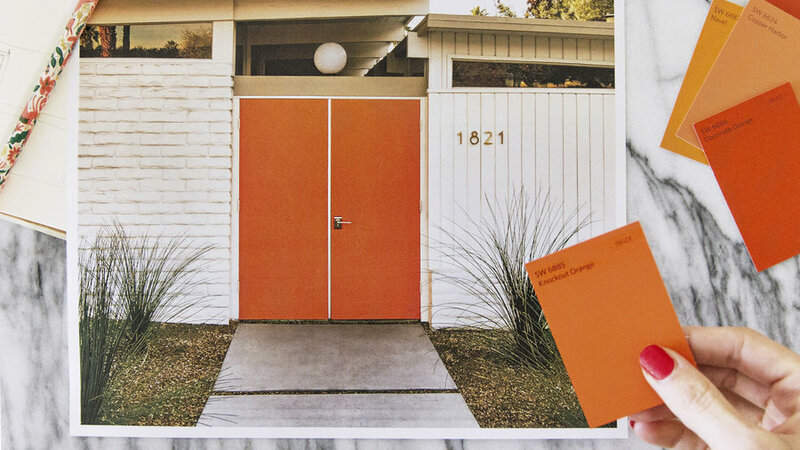 Paint your front door a vibrant color for a dramatic statement. 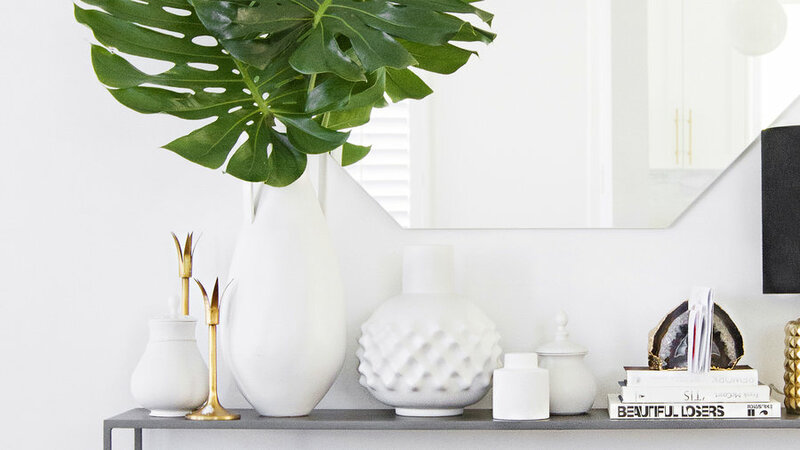 Pull out all your vases, ceramics, and other favorite objects that share a theme (shape or color) and display them in a grouping to create a focal point. 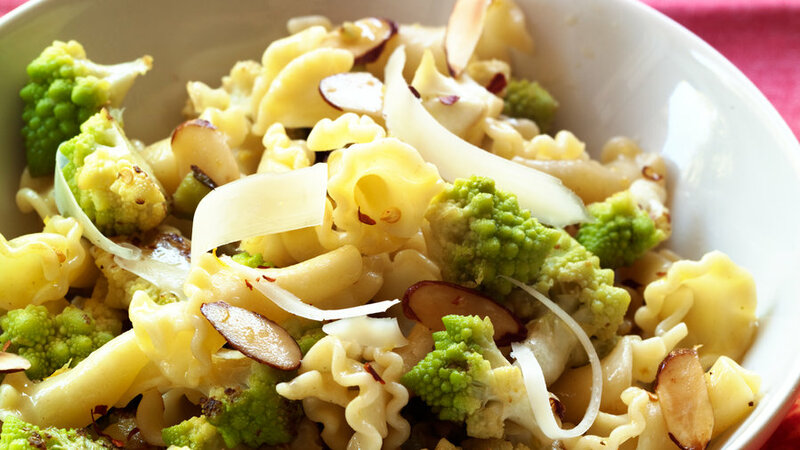 Add finely chopped preserved lemon to your favorite vinaigrette, then use a vegetable peeler on a chunk of parmesan to create beautiful, spiral curls to top it off. 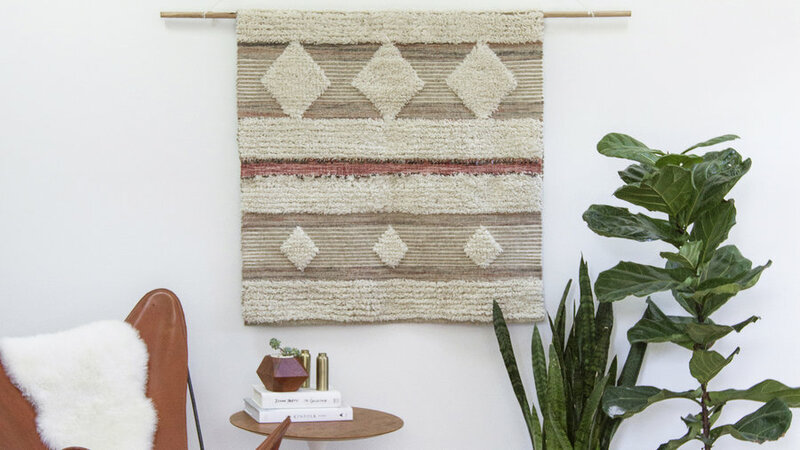 A raffia-wrapped vase, a wicker table, a sea grass basket, a rattan dining chair—whatever you choose, woven items break up the common textures in a room, bridging the gap between soft upholstery and hard furnishings or wooden flooring. “A plant without a top dressing is like an unmade bed,” says Annette Gutierrez, owner of L.A.’s Potted. 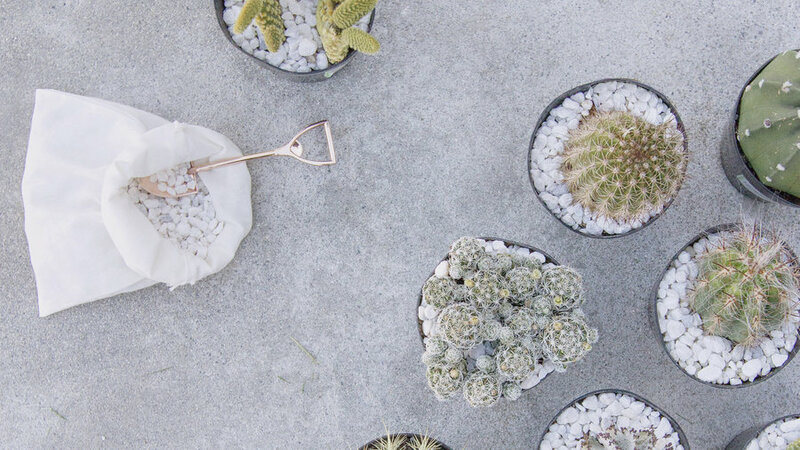 Adding a top layer of prettiness—crushed seashells, black river rocks, marbles, bark, tumbled glass, fuzzy moss—to your container plants will cover up a multitude of sins—and help the plant retain moisture. It’s easy. 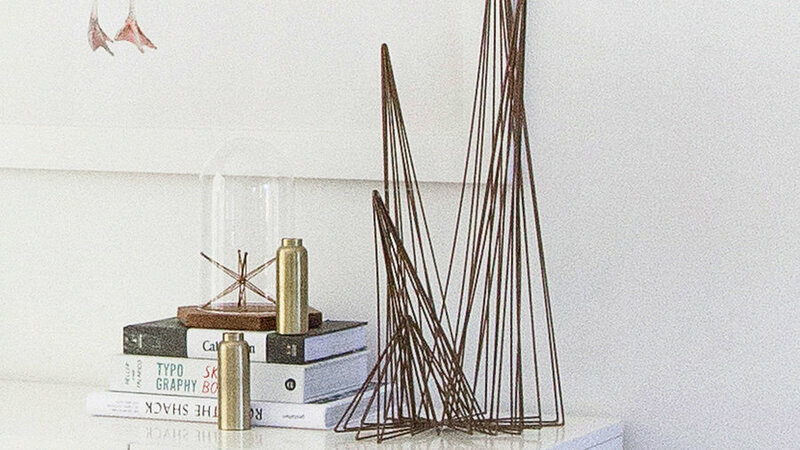 Pick a metallic—like a lamp or the candlesticks here—and sprinkle it throughout the room in a handful of pieces. It will warm up the space instantly. 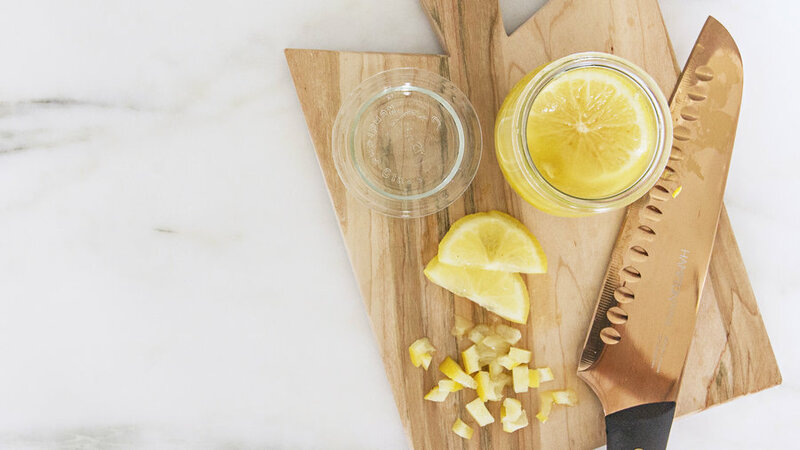 Squeeze in lemon, cider vinegar, or another acidic ingredient. 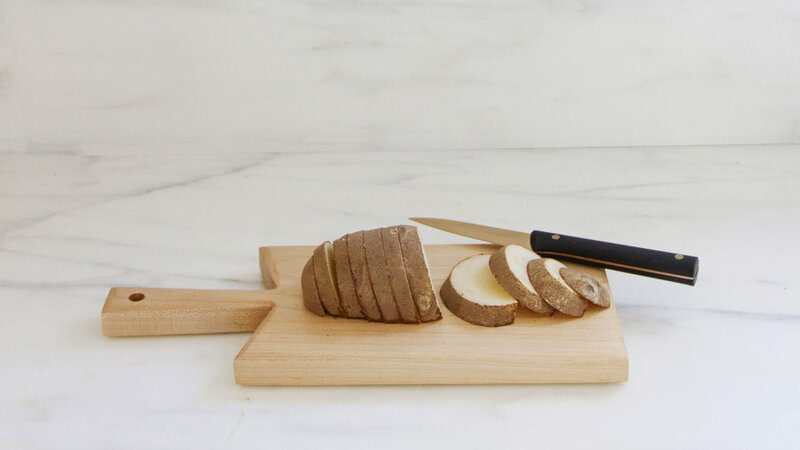 If it’s a soup or stew, add a cut-up raw potato; it will help absorb the salt, and you can use it for something else once it’s cooked. 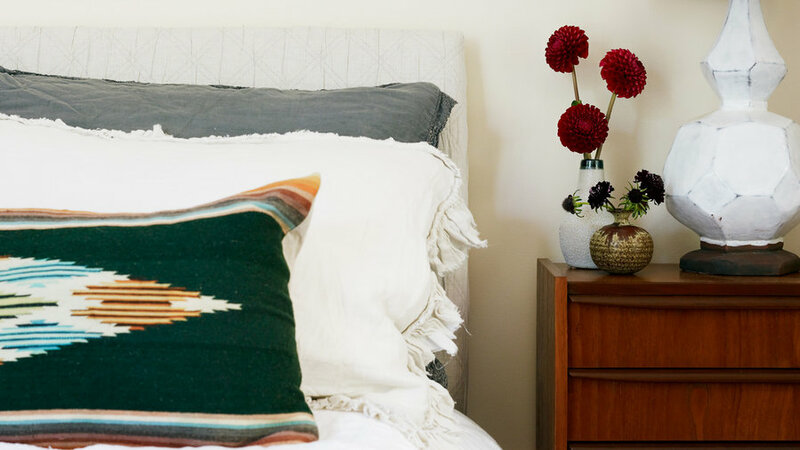 If your bed looks like Papa Bear’s—after he slept in it—you can fix it with more pillows and a method for putting them together. 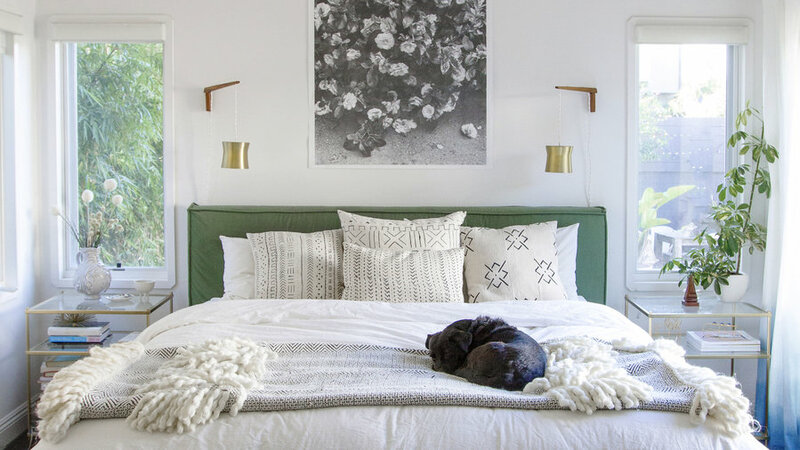 Here’s a foolproof formula: Starting with a solid bedspread (though it can be textured for interest), add two standard pillows in white (with or without colorful trim), three coordinating patterned throw pillows, plus a patterned bolster or lumbar pillow. 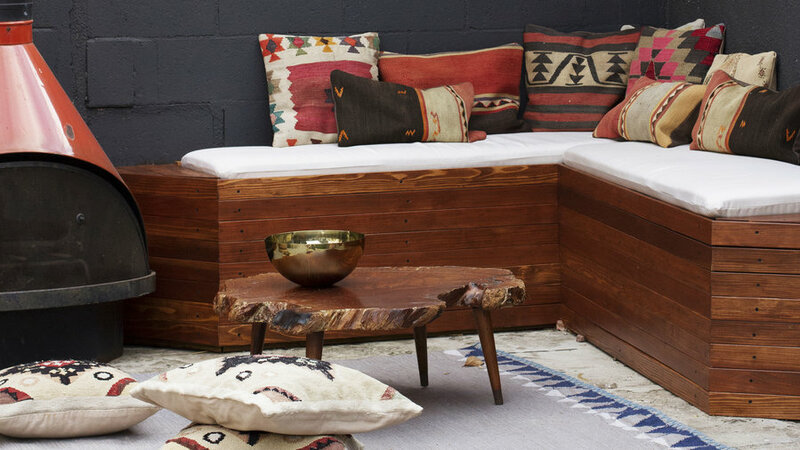 To top it off, add a throw in a color that picks up on the patterned bolster. 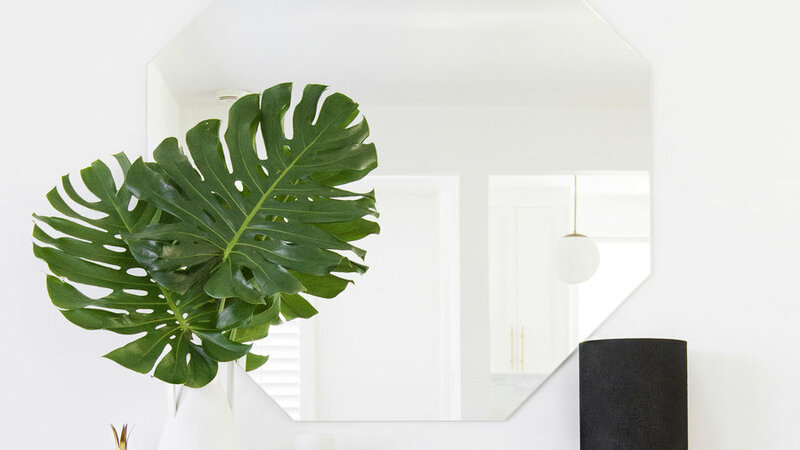 To create the illusion of a larger room, add dimension to a space, or create a new view, place a mirror in an interesting shape (like this octagonal) in an entry hall, above a fireplace, or in a recessed area that you want to spotlight. For a different look, group several small mirrors together. 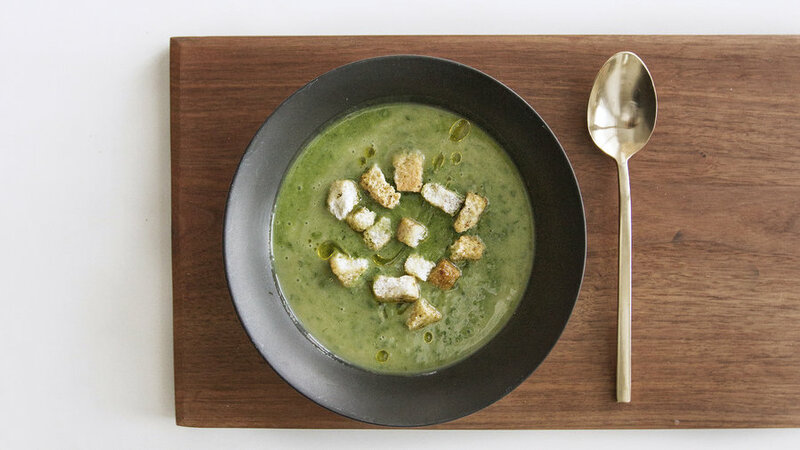 What to do when the bag of greens at the back of the fridge has seen better days? 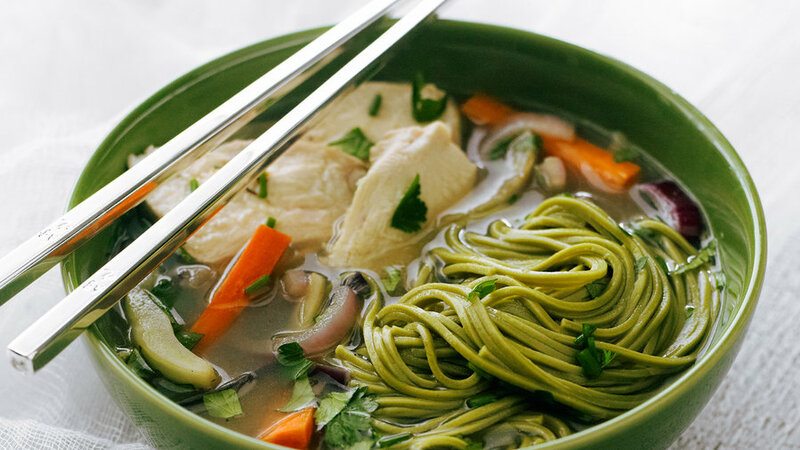 Whiz wilted greens in a blender with chicken broth, heat till boiling, add tiny pasta (little shells or stars) and some shredded chicken, and you have a verdant green soup. If the greens are lemony (say, from leftover dressed salad), rinse them first. 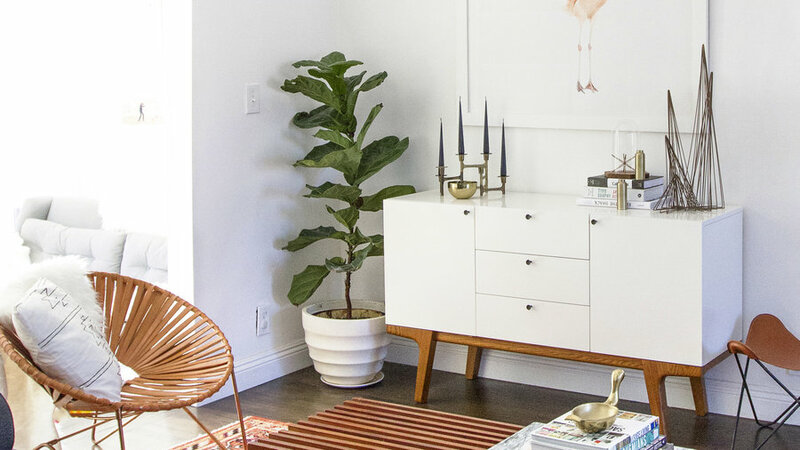 The problem: Your houseplants are losing their luster. 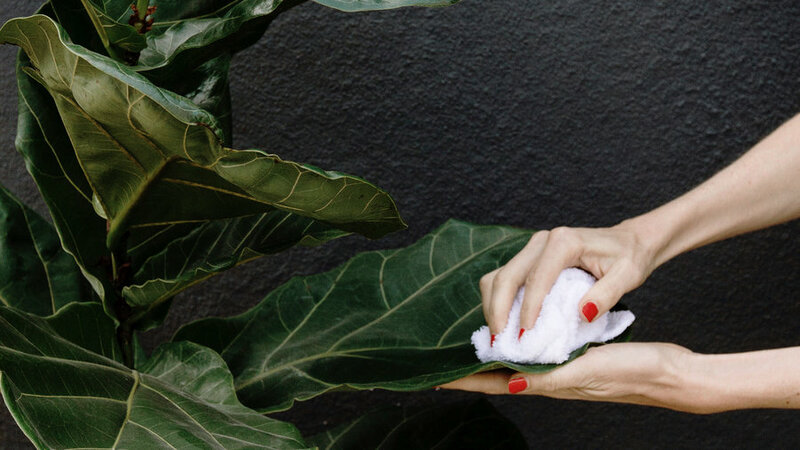 The fix: Once a month, wash the leaves with a dampened cloth or soft sponge, supporting the leaf from below with your hand to prevent tearing. 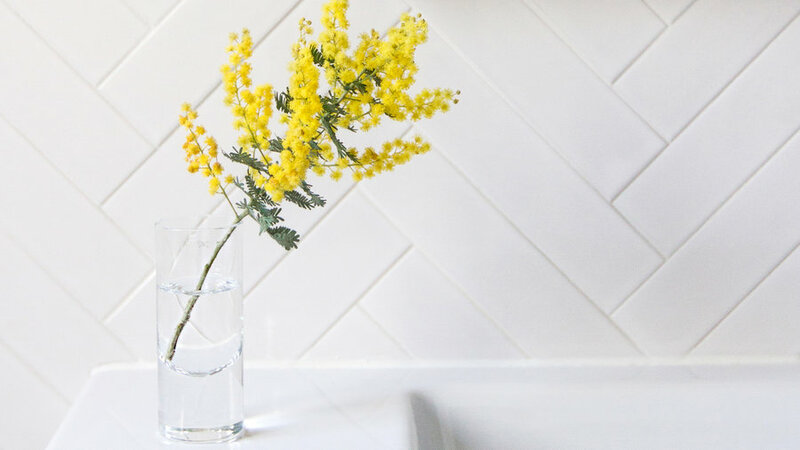 The bath will remove dust—upping pest-resistance and the plant’s ability to photosynthesize and keep that shine. 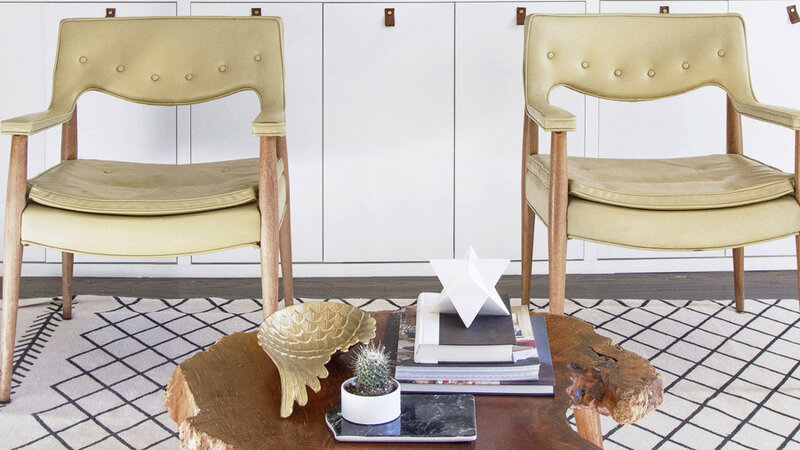 Four basic elements—a tray, a natural element, books, and a decorative object—can give your coffee table a wide range of looks. 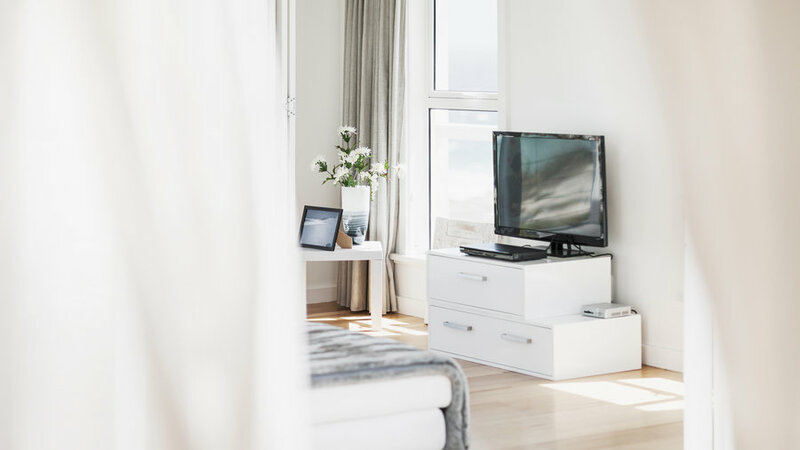 A tray (or even a beautiful slab of wood or a ceramic platter) is a must for coralling remotes and giving them a home. Next, add a natural element like a terrarium or potted succulent to the tray. 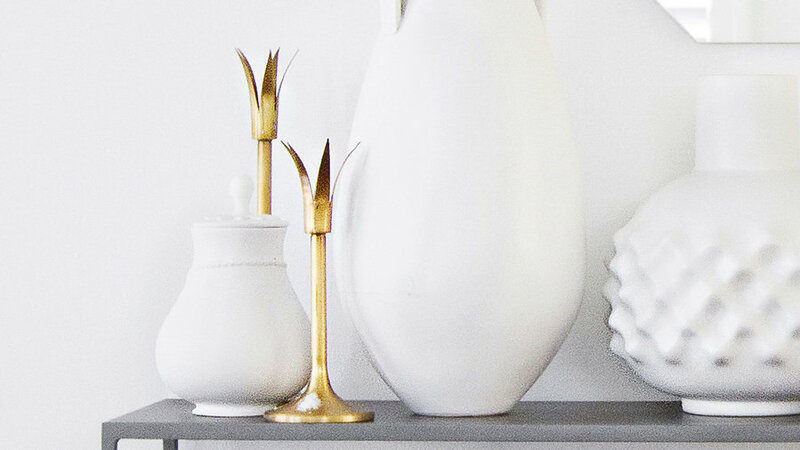 Then set a stack of books next to the tray and top the stack with an interesting decorative accent: This could be a memento, a small sculpture, or a flea-market find—anything that hints at your personality or history. First, “Take everything off the shelves and start fresh,” advises Katie Raffetto, who has her own design firm in San Francisco. 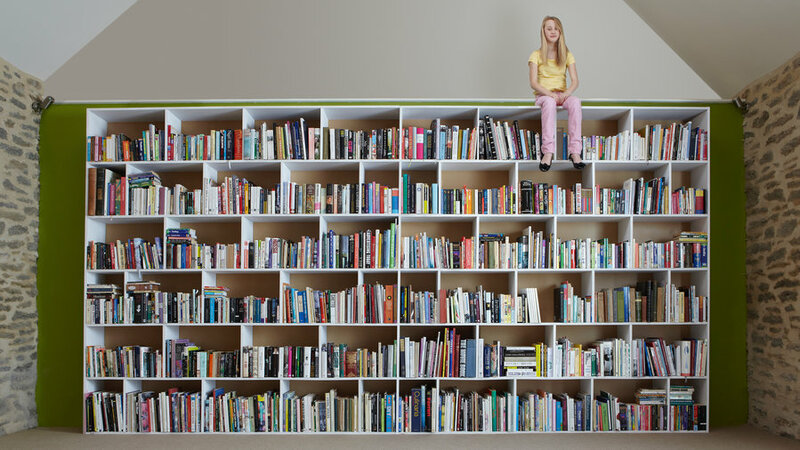 Next, place books both vertically and horizontally, sprinkling the two methods throughout (pull the spines all the way to the front of the shelf so they look even, or turn so backs face the wall). 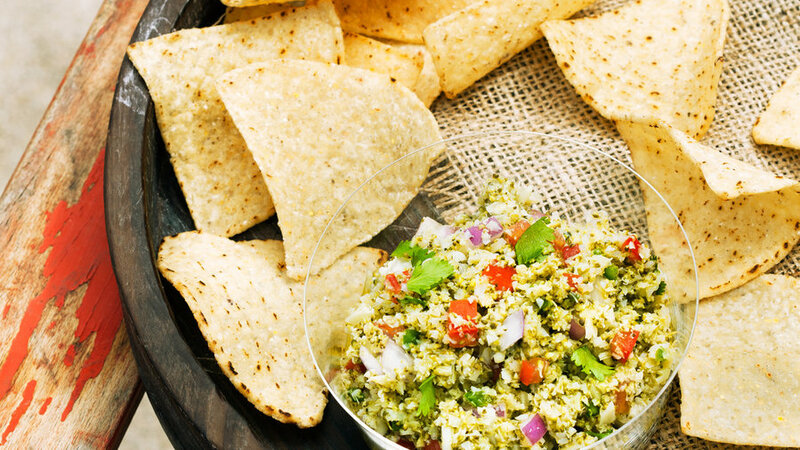 Stand back periodically and look at the mix—and don’t overcrowd! 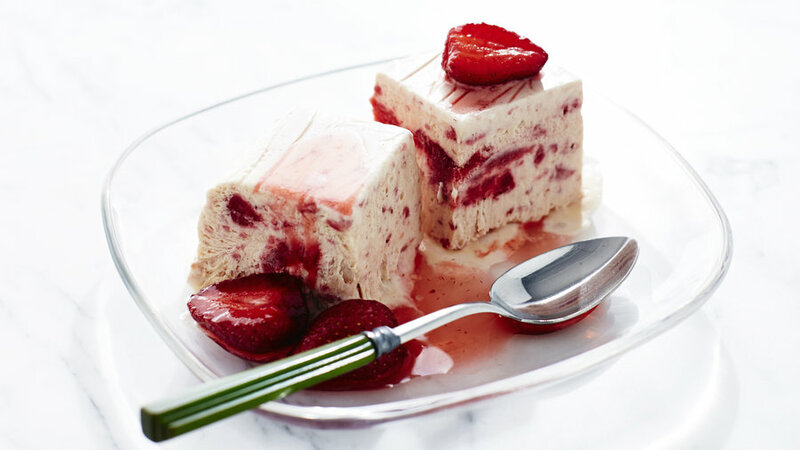 “If you wean out, it will look so much more fresh and new,” Raffetto says. Next, add objects to fill in the holes: little sculptures, baskets, decorative boxes, ceramics. 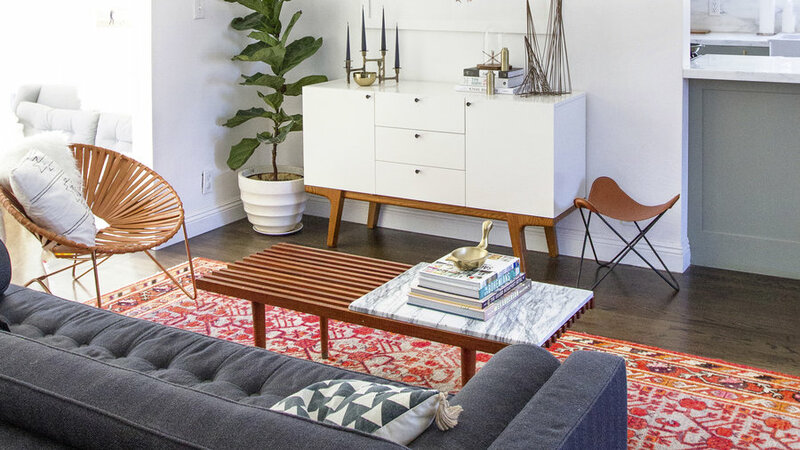 Try to keep them within a broad color or materials palette to make the whole look cohesive. Three steps: Cut in quarters. Pop the pit out. Pull off the skin. Usually if an orchid is recalcitrant, it’s not getting enough light. But you don’t want harsh light; rather, place it in bright, filtered light (think a window with a sheer curtain). 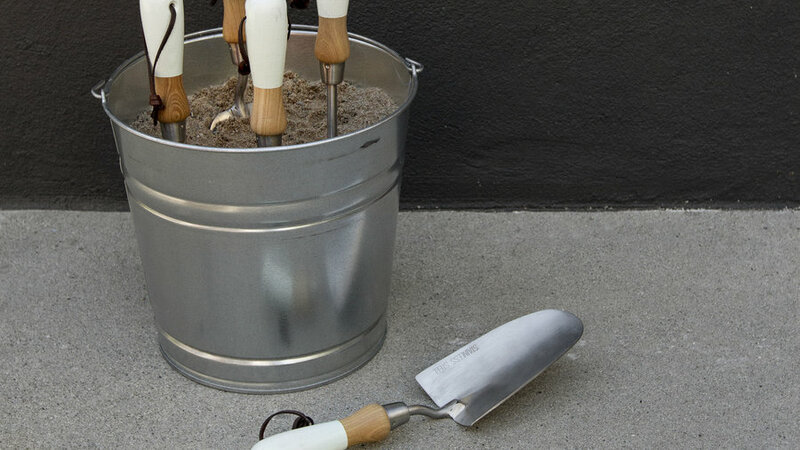 To keep them clean and sharp, place them, sharp side down, in a bucket of sand. Mount drapery high over your window—it’s more dramatic and brings the room up instead of down, says Krista Schrock of DISC Interiors in L.A. She also recommends neutral drapery to help frame the vista, a textured fabric to warm up the feel of a room, and a minimal drapery rod that returns to the wall so it doesn’t distract from the view or curtains. 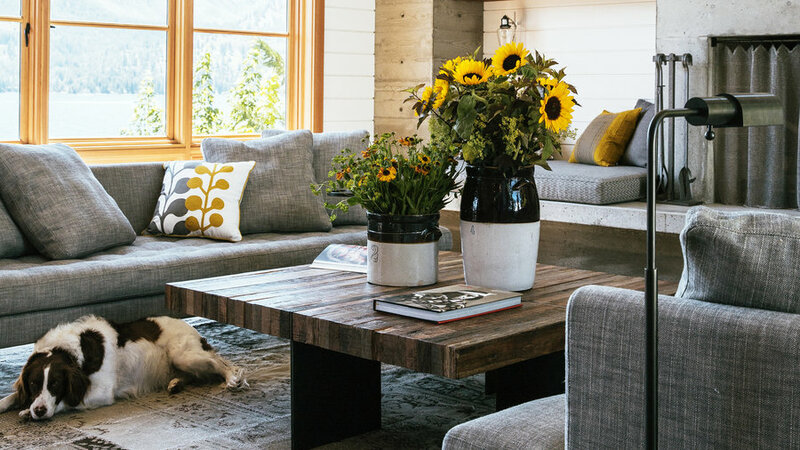 In a living room, all furniture legs in a seating arrangement should be sitting on the rug or, if that’s cost prohibitive, at least the front legs of sofas and chairs. In a bedroom, a rug should extend at least 18 inches beyond the sides of a queen or king bed so it doesn’t feel dwarfed by the bed. Remember: It’s always better to err on the side of too big than too small. 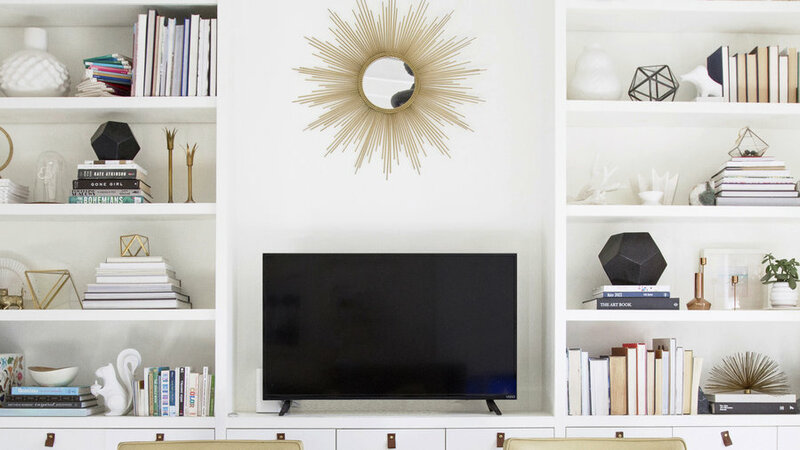 The bigger the room, the bigger the fixture should be. 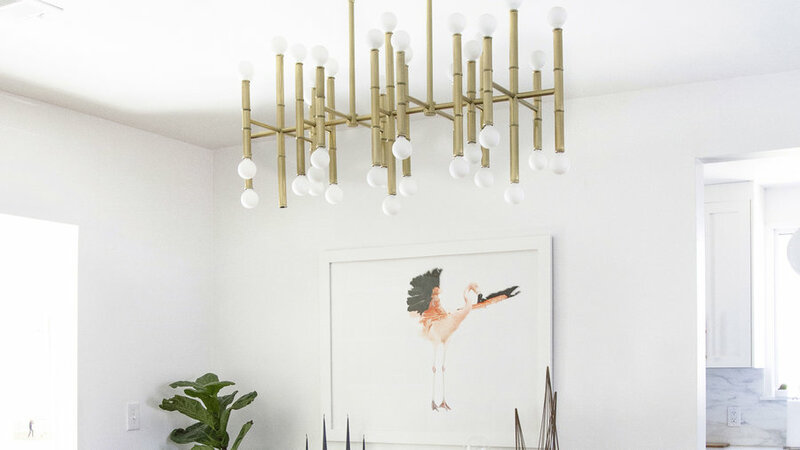 Try this formula: To size a chandelier as the focal point of a space (a foyer, living room, or dining room), measure the room’s length and width. Add those numbers together, and the sum (in feet) is the approximate recommended diameter of your chandelier (in inches). 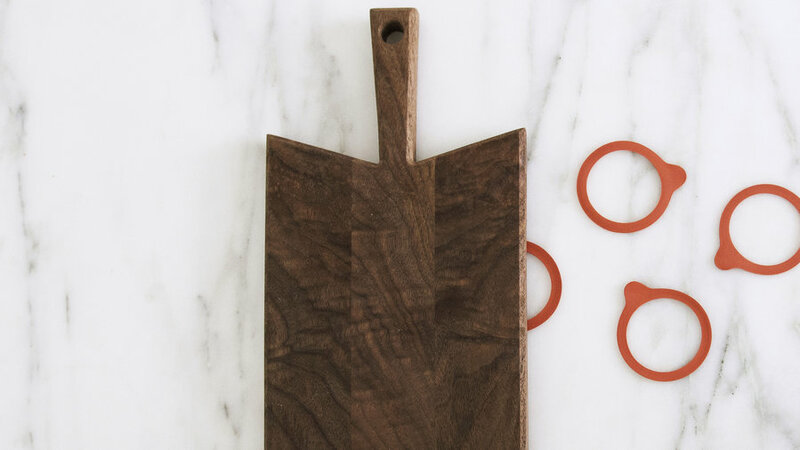 Nick Balla and Cortney Burns of San Francisco’s Bar Tartine have a genius idea: Place rubber seals from swingtop jars under your cutting board to keep it from slip-sliding away. The seals are much more sanitary than paper towels or a mesh cloth, and afterward you can just toss them in the dishwasher. 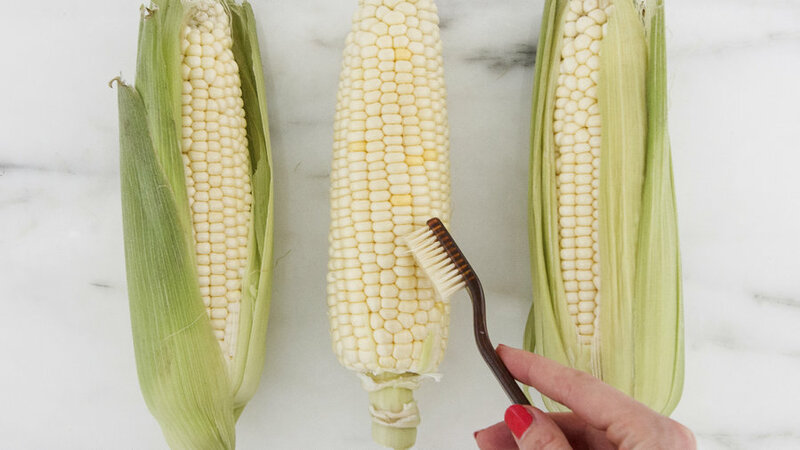 An (unused, of course) toothbrush is ideal for cleaning the silk off corn, getting dirt out of deep shoe treads, cleaning jewelry, and the grout on tile floors. Group things in threes (or another odd number) and vary the heights (say, a tall lamp next to a medium can­dle next to a low stack of books). Think of decor as you do jewelry: Just as you’d never wear every piece at once, winnow down and watch how it elevates what’s left. To avoid dead space, place something in the corners. 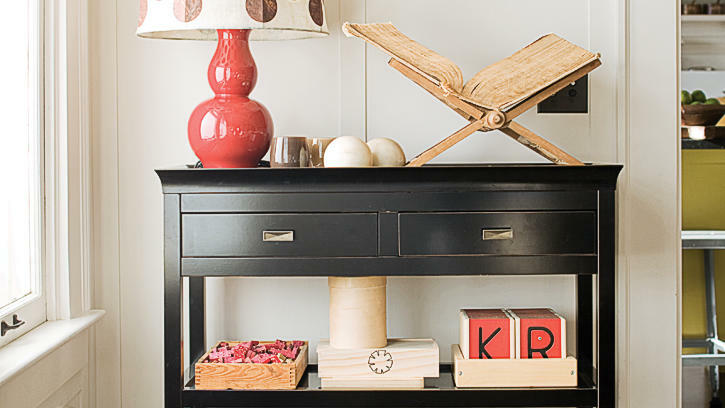 Four good looks: a pedestal table topped with a stack of books or accessories. An indoor tree, like a Dracaena, ficus, or rubber tree. A pedestal topped with a vase or favorite object. A bookstand holding an open art book. It’s summer’s perennial problem: You’ve just clipped one perfect flower from the garden but can’t find a vase petite enough to show it off. Raid the kitchen cabinets for a shot glass instead (one with tall sides is ideal for supporting a stem). 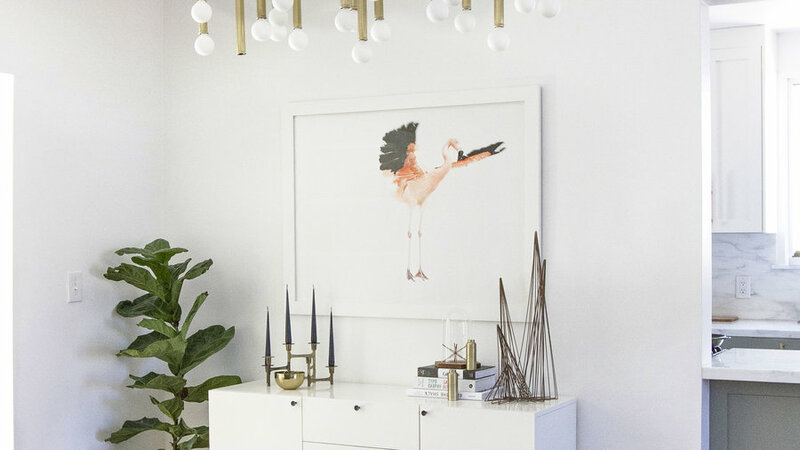 “With a single bloom, I usually like to go big with a protea or a peony,” says the designer and art director behind many of our life hack photos, Sarah Sherman Samuel (sarahshermansamuel.com). 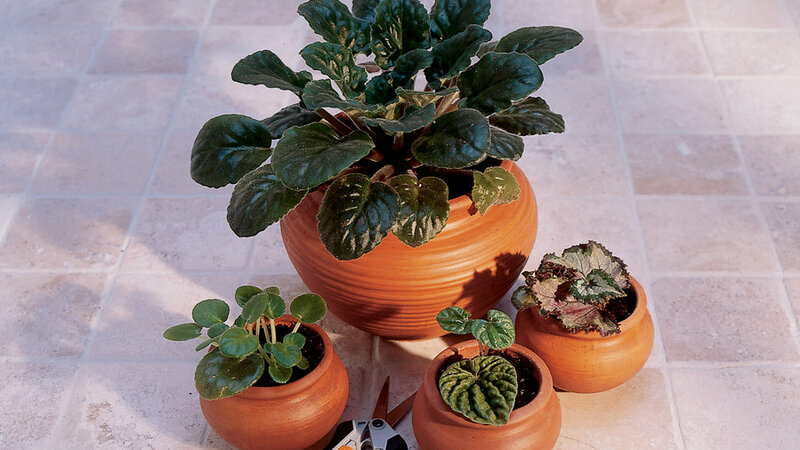 “I also like to single out large leaves like the monster leaf.” She’ll spread her solo arrangements on window ledges, on top of a stack of books on a shelf or coffee table, or beside the bathroom sink. 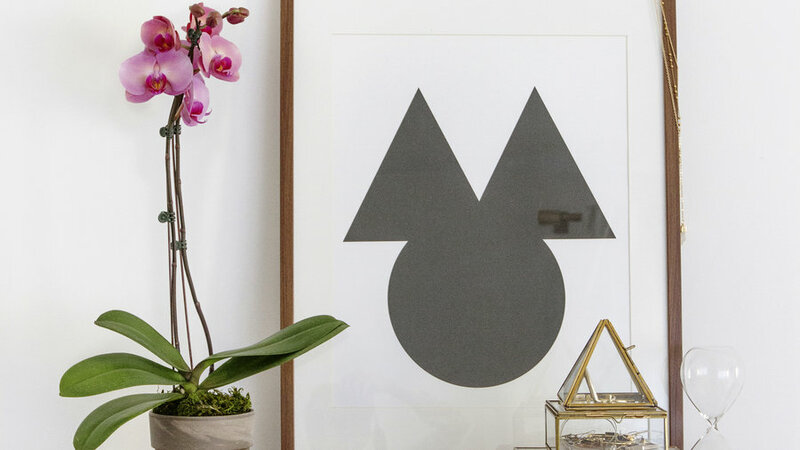 Use this trick: Hold the picture up on the wall and scoot it down until the center of the frame is roughly at your eye level (split the difference if your home has both short and tall people). 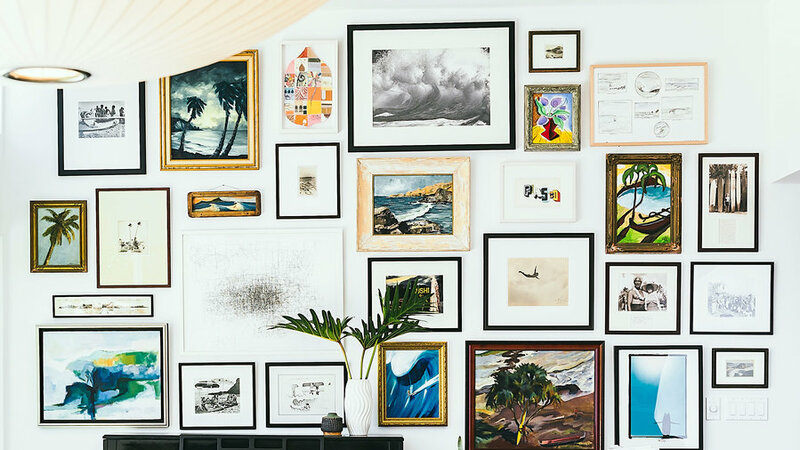 Also, think about how your room is used: Art in the entryway, where people usually stand, can be hung higher than in a dining room, where most people are seated. Mix 1 tbsp. 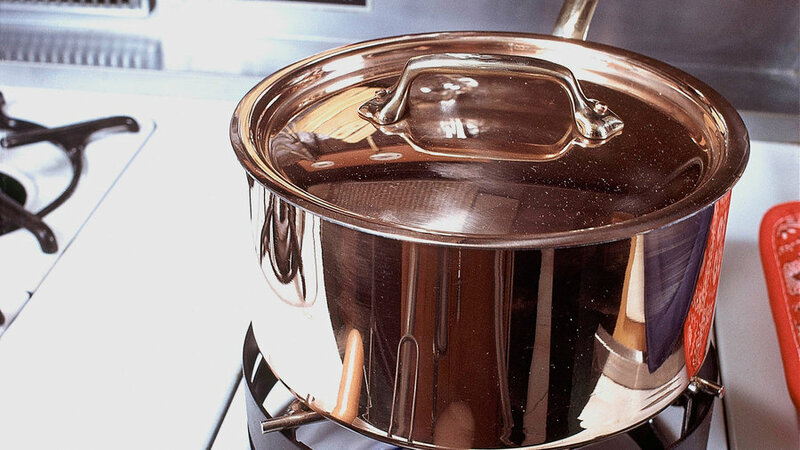 salt and 1/4 cup of white vinegar and apply with a soft brush to keep your copper pots glowing. 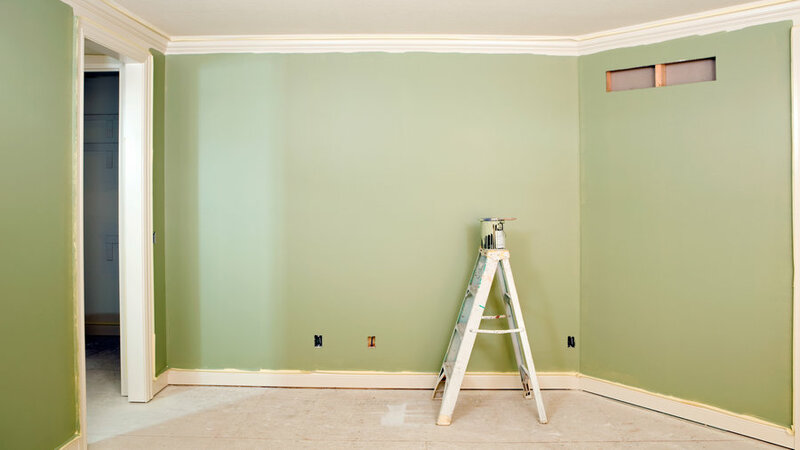 Paint baseboards and molding a color that contrasts with your walls. It’s like contouring for your home’s architecture. 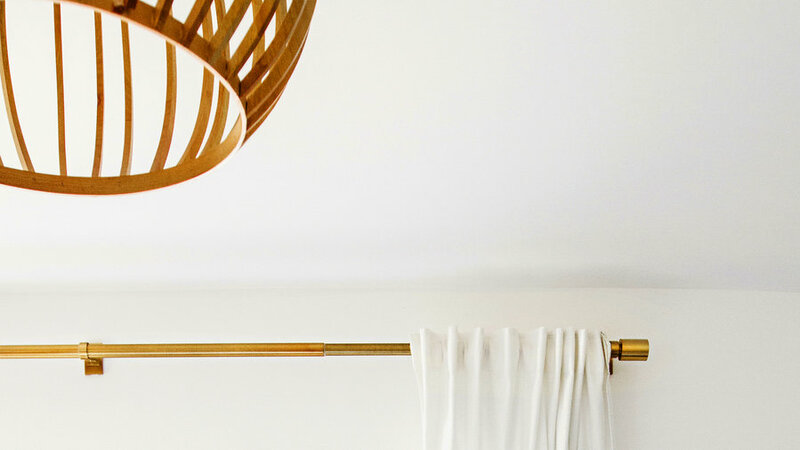 Hang drapery over doorways to soften transitions between rooms. Bonus idea: Accentuate the height of your windows or doorways by adding trim to the drapery. 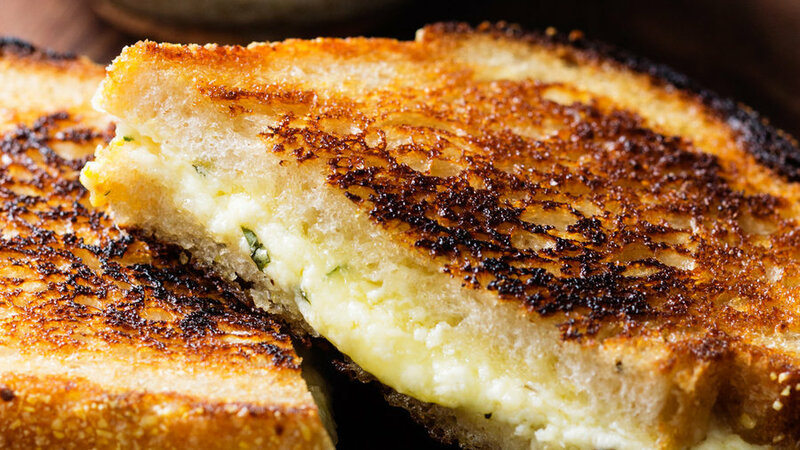 Spread the outside with mayonnaise instead of butter. 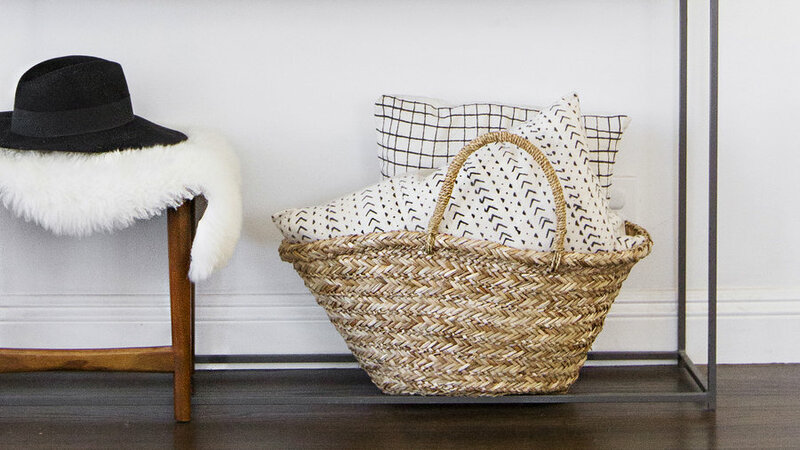 Make any sofa or chair look fresh by adding a fluffy Mongolian lamb pillow. Where’s your best view? Rearrange the furniture toward it and see how much more often you find yourself sitting there. 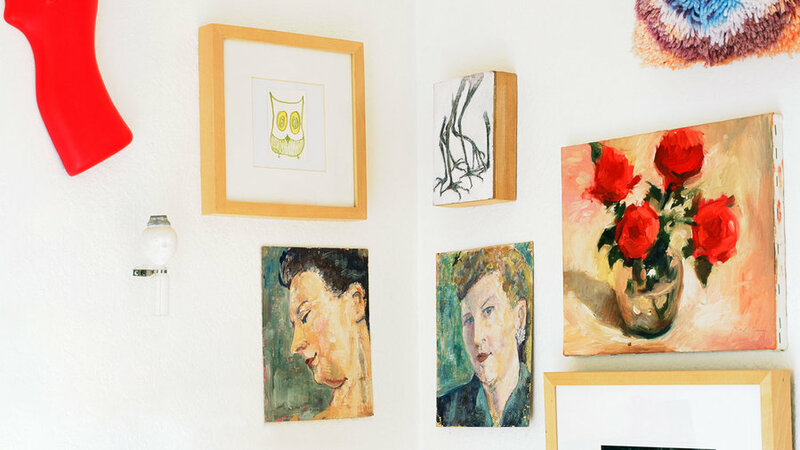 Paint the interior back wall of your bookshelves. It’s a great way to bolster an accent color from somewhere else in the room. Add 1 tbsp. 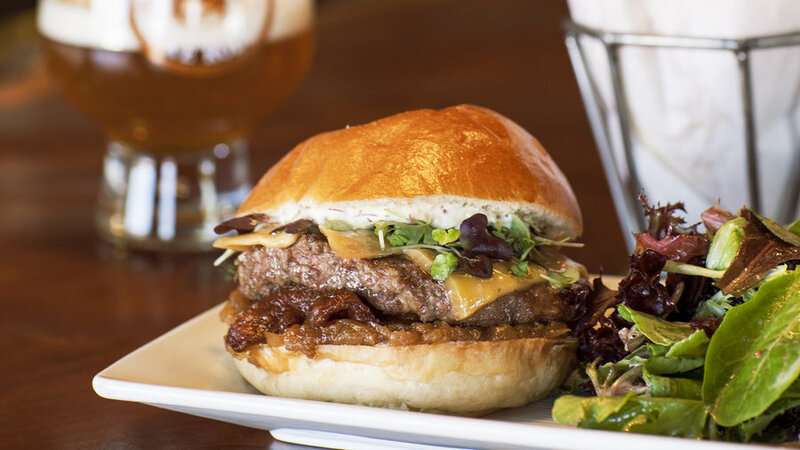 of fish sauce per pound of ground beef or turkey for added umami flavor. Add down inserts to your pillows. 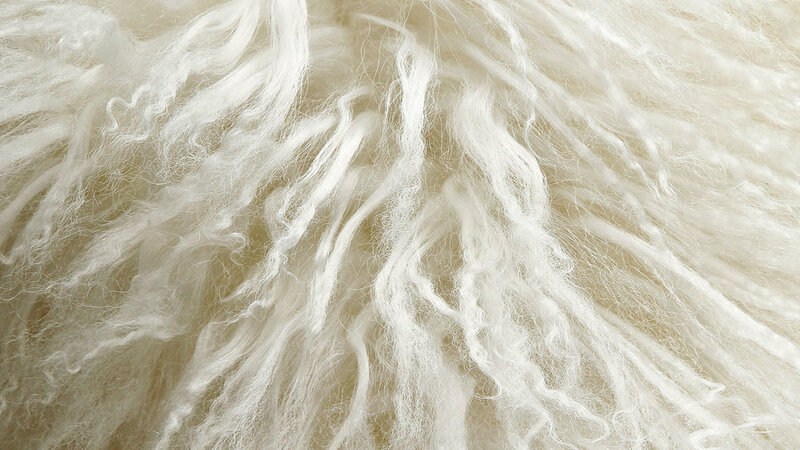 It will gift them a plushness that adds instant luxe to a room. Add a piece of kombu (Japanese dried kelp) when you’re simmering the chicken carcass. It’ll add depth and body to the stock without noticeable seaweed flavor. Keep on hand a few empty half-bottles. When you drink half of a 750-ml bottle, pour the rest through a funnel into the split, recork it, and store it in the fridge. 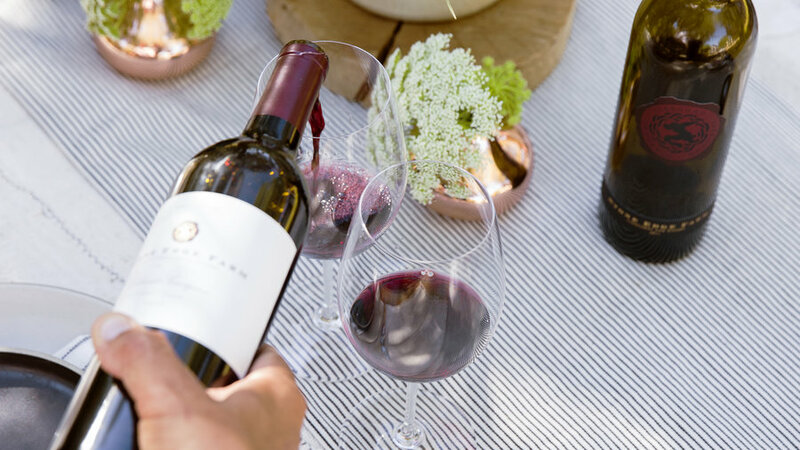 With little air to oxidize it, the wine will keep for up to five days. 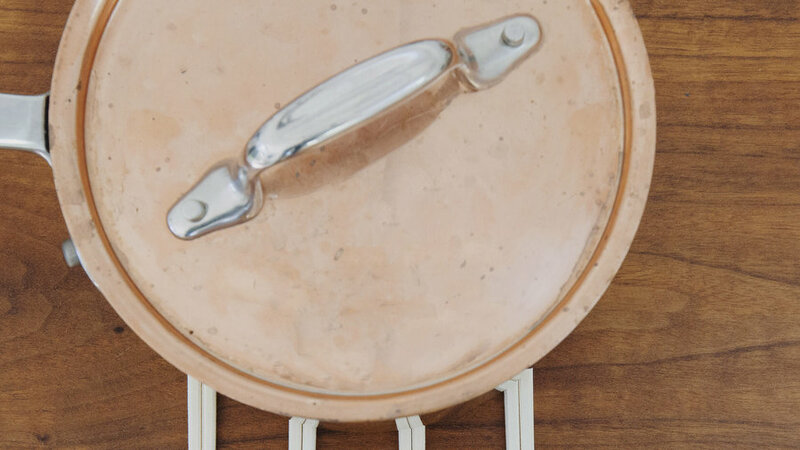 Have an heirloom piece that feels tired? 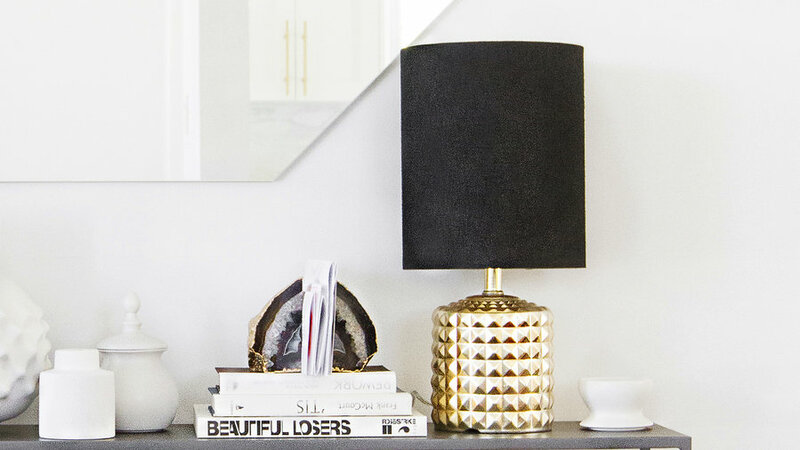 Paint it black, like this side table. Suddenly, its lines will appear more distinct and modern. Use it to add weight or bring attention to a favorite object. 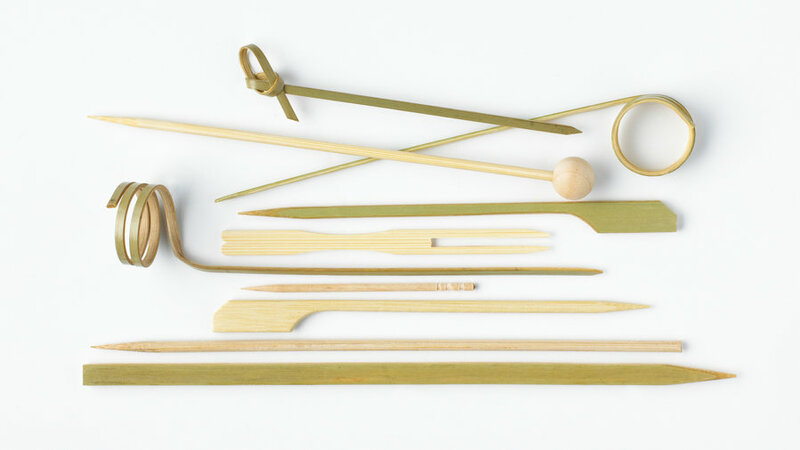 By surrounding it with space, you will elevate a seemingly ordinary, humble object into art. 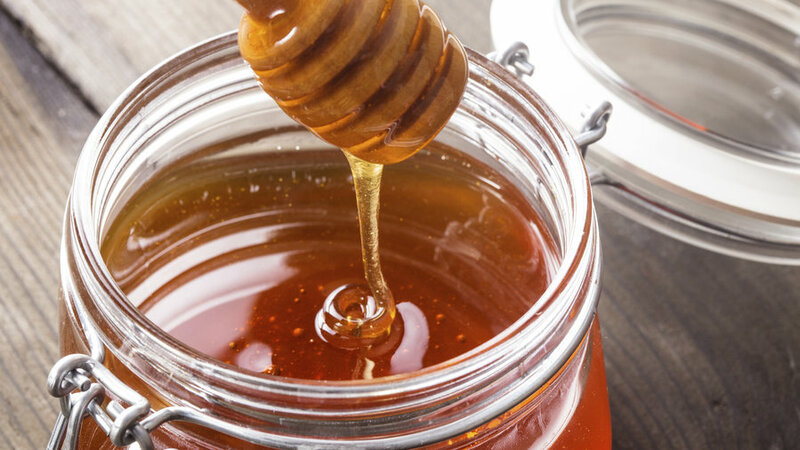 Dip a fork straight down into honey, lift it straight up, and evenly drizzle onto your yogurt or toast—no globs. Put wood chips or other smoking ingredients (tea, herbs, spices) in the bottom of a large, foil-lined wok. 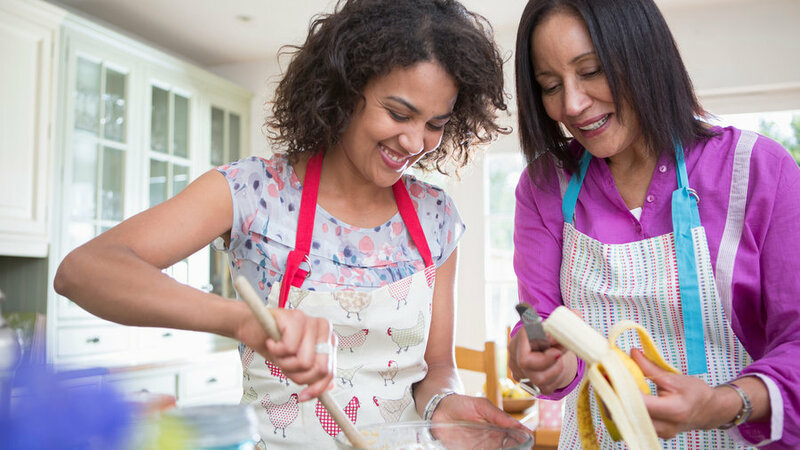 Set a cake rack over the ingredients, cover with a tight-fitting lid, and heat until smoke begins to form. Add food, cover wok tightly with foil and its lid, and let it smoke. The food will still need to be cooked afterward, but it’ll have a nice smoky nuance. 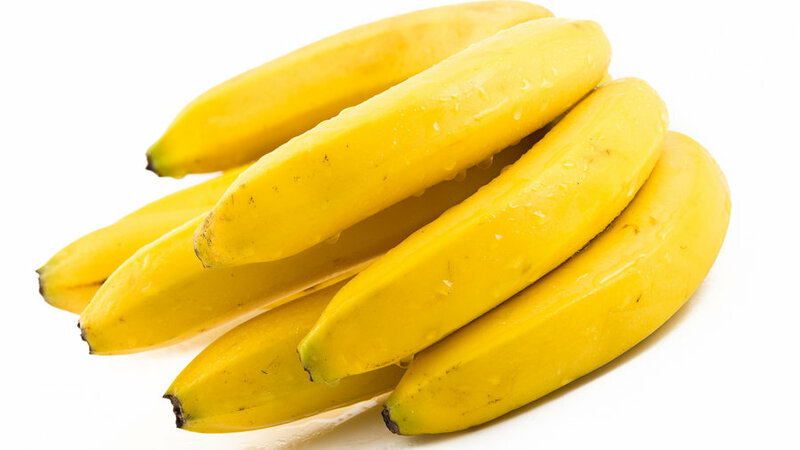 A half a banana works great as an egg substitute (aim for half a banana per egg) in cookies. 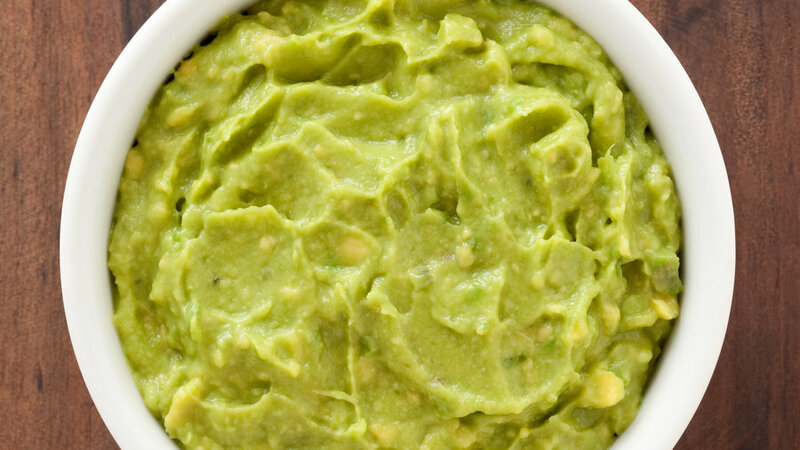 Use a pastry blender to mash avocados into guacamole (or to spread on toast). 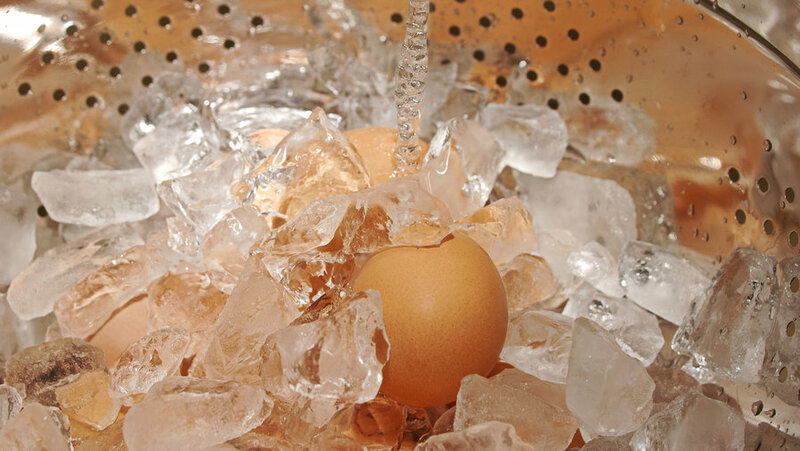 Instead of putting a bowl full of hot food in a larger bowl of ice and cold water—which risks water getting into the hot food—set a colander in the ice bath, then your hot bowl in the colander. 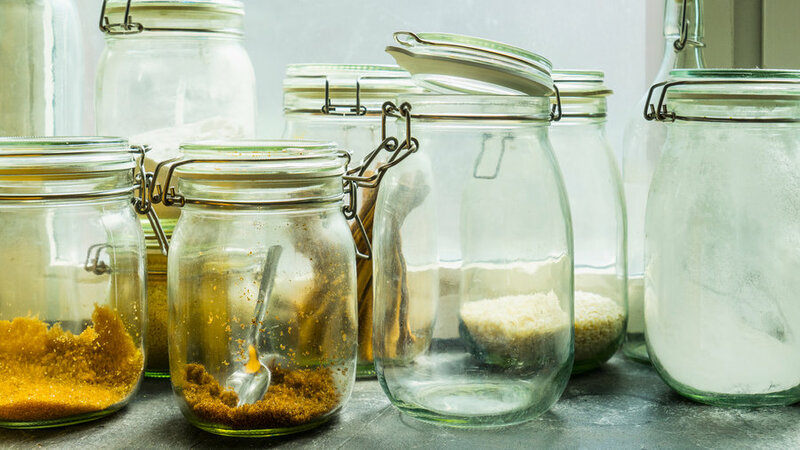 Empty spice jars make a great weekend-size bottle of olive oil, vinegar, or mustard for camping or a vacation rental. Use kebab sticks to clean little kitchen corners and crannies, especially around the stove. 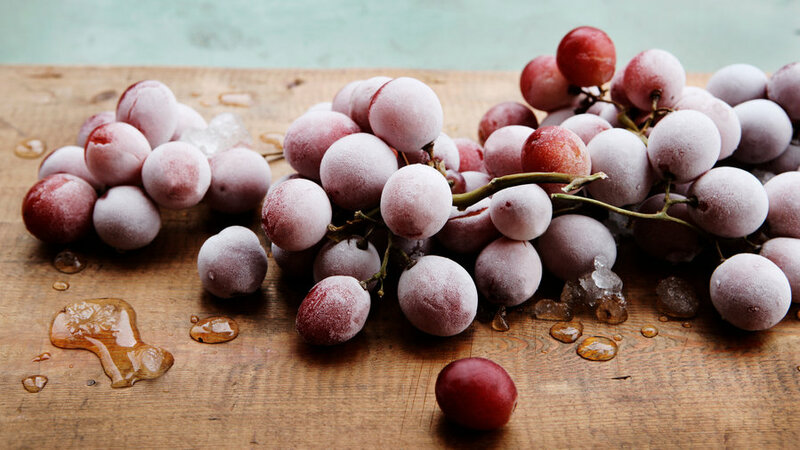 Wash grapes, then freeze in an airtight bag. 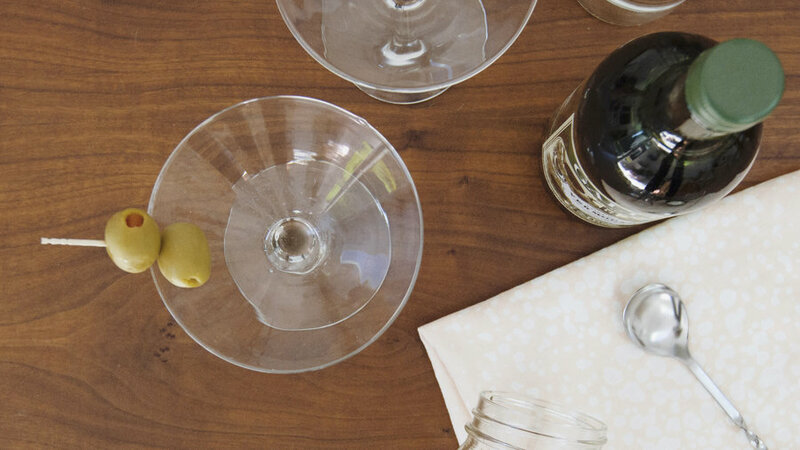 They’re great for keeping cocktails or white wine cool without diluting. 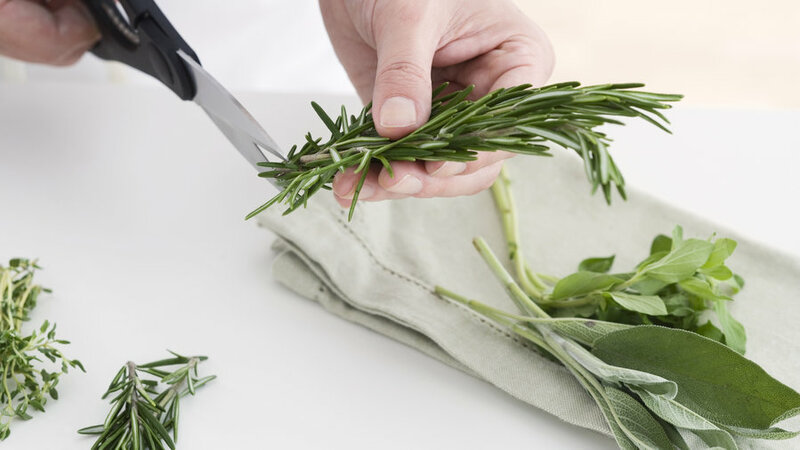 Unless you’re a knife virtuoso, kitchen shears are much easier—and faster—to use to chop fresh herbs. 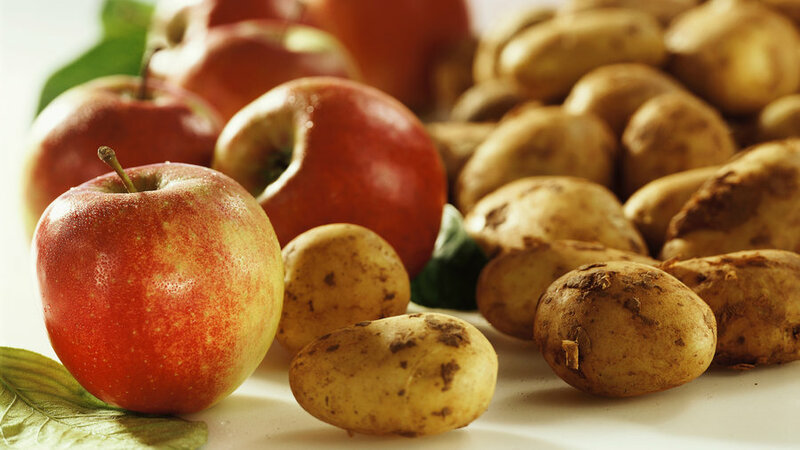 Add an apple to a bag of potatoes to prolong the spuds’ life. 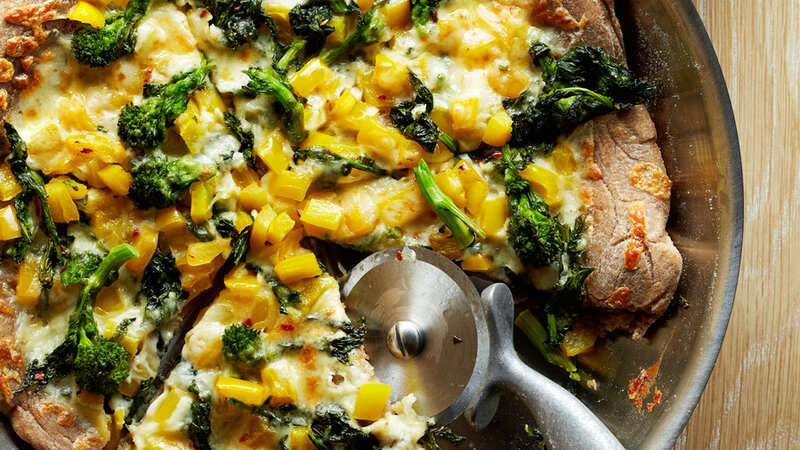 Use a frying pan to reheat cold pizza. It will keep the slices crisp. 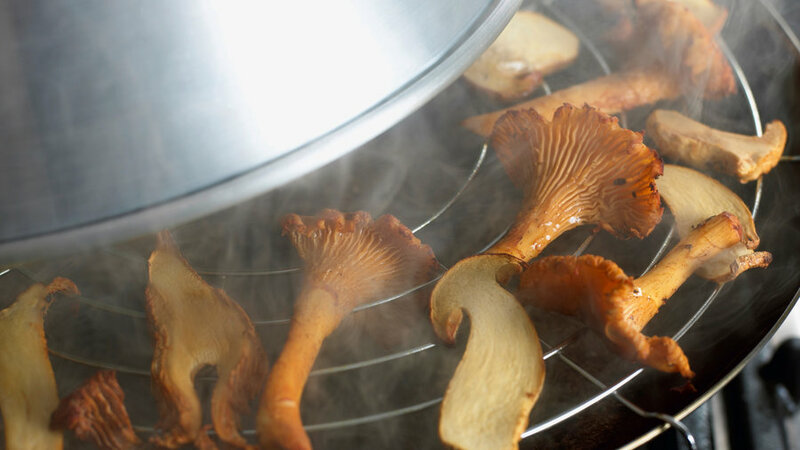 Dry the leaves thoroughly before chopping; then they’ll sprinkle evenly, instead of in clumps. 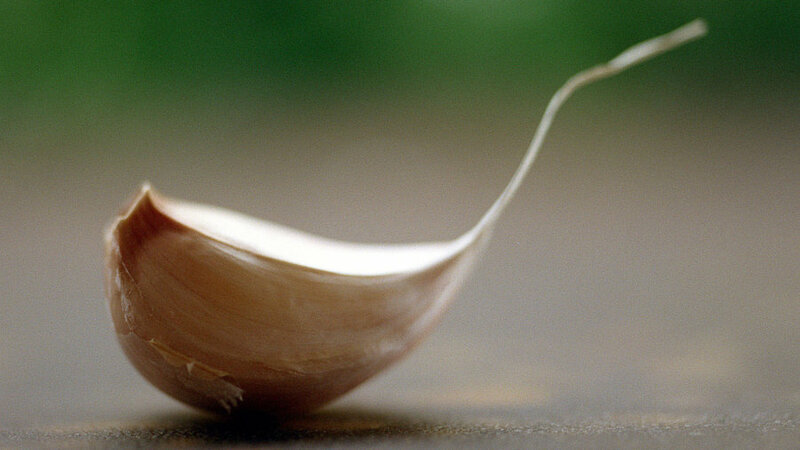 Chef and cooking teacher Joanne Weir shared this tip: Soak a garlic clove in water for 5 to 10 minutes. The skins will slip right off. Place the plant deep and on an angle. 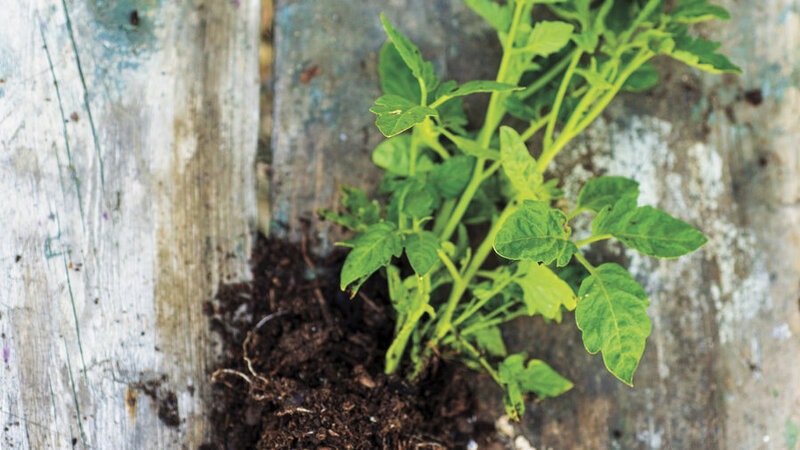 Tomatoes will grow roots instead of leaves if their stems are buried. 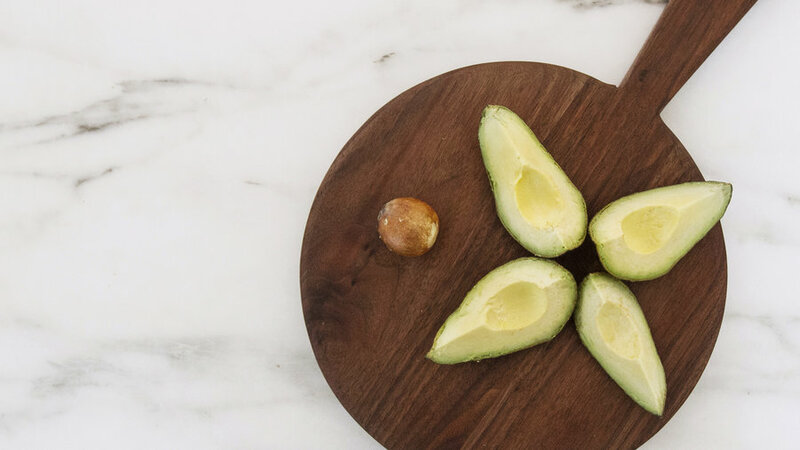 Toast nuts before using in a dish; the heat will bring out crunch and flavor. 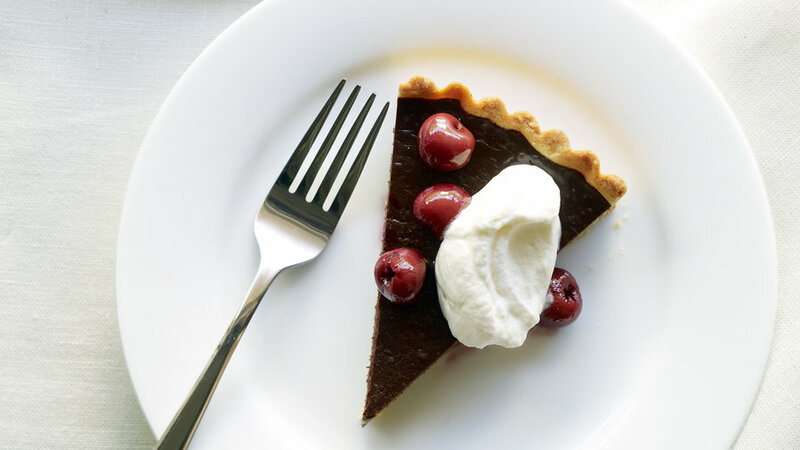 Borrow a tip from Dana Gunder’s Waste-Free Kitchen Handbook (Chronicle Books, 2015): Plan on five to six bites per person if there’s no dinner following, and two to three if you’re serving dinner afterward. Instead of buying new plants at a nursery, root cuttings of basil, rosemary, geraniums, coleus, and so many more plant varieties in water. 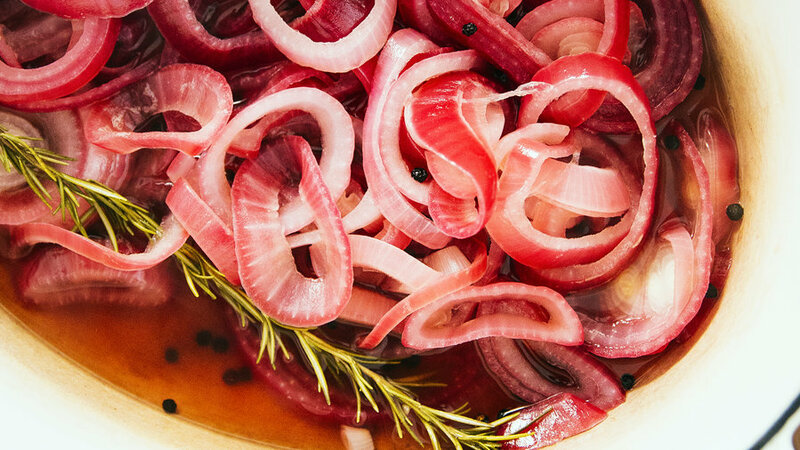 Pop the onion in the freezer for 10 minutes before slicing. Choose an organizing principle. Either all the frames should be the same style and color (varying the size and matte is fine in this case), or they should all be hung on the same horizontal or vertical axis. Pop them in the oven at 350 degrees for 10 minutes. The heat will re-crisp them. Insert a plastic straw from the tip to the top. It will push out the core and stem. 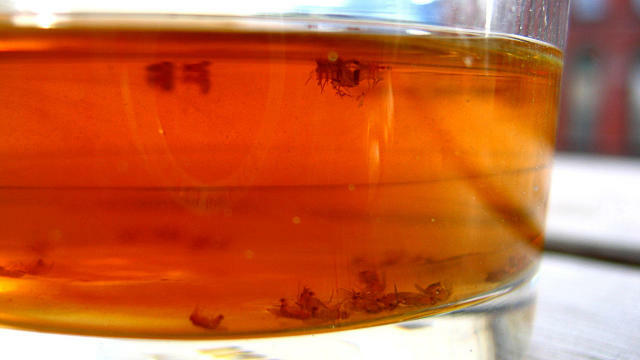 Squeeze a small bit of dish soap into a bowl of apple cider vinegar. It attracts and traps the flies. Kathy Kramer, of Bringing Back the Natives garden tour, shares this tip for losing the lawn. 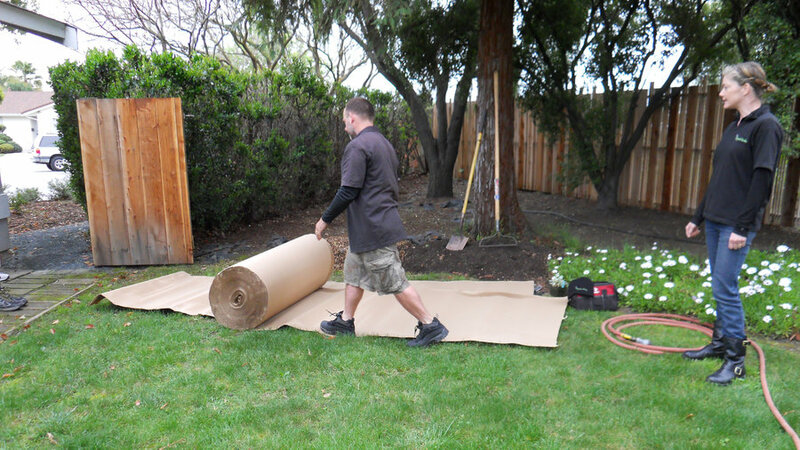 You might have read about covering the lawn with plastic to solarize it. That actually kills all soil life—not the best way to start your new garden. Instead, sheet mulch it: Smother the lawn with layers of cardboard, compost, and mulch, which eventually decompose into well-amended soil, perfect for planting. 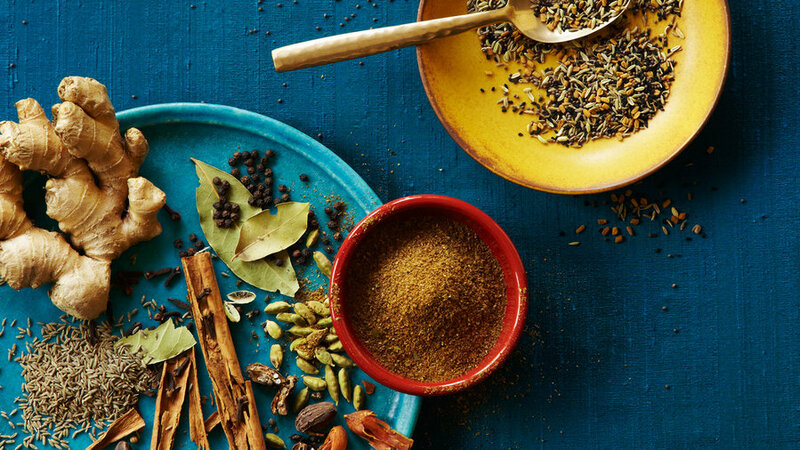 Because most ground spices lose their flavor after a year, buy whole spices and grind them in a coffee grinder (separate from the one you use for coffee grounds) as you need them. 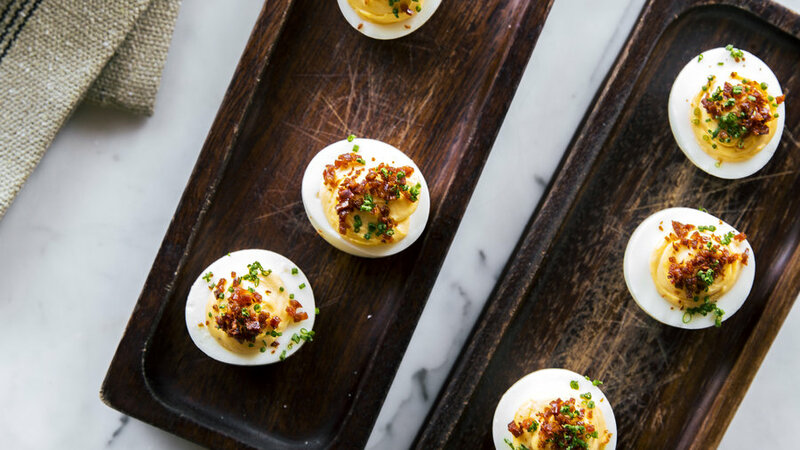 Add a pinch of honey, maple syrup, or balsamic vinegar to balance the flavors. Take it all the way to butter (in the food processor, if you like). 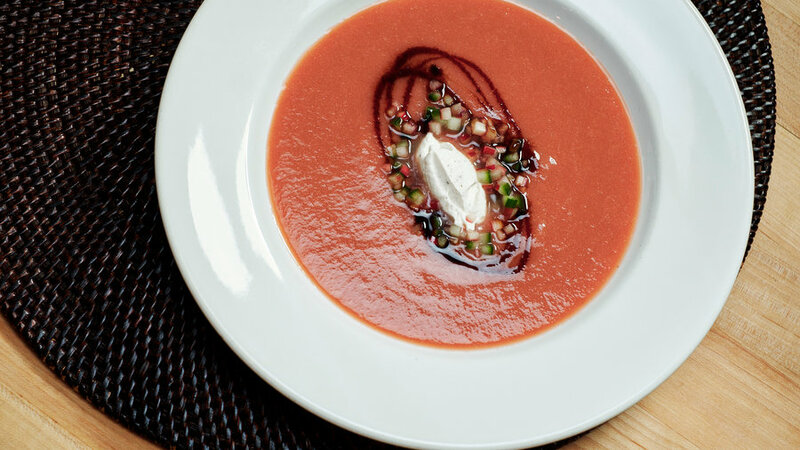 It will taste extra-sweet and fresh, and you can use the whey in a smoothie or soup.